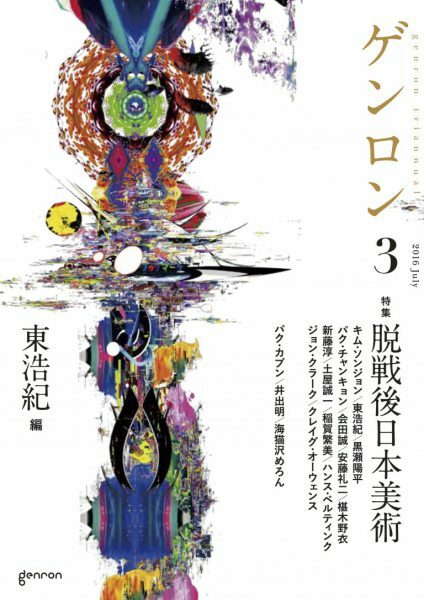 Before you is the third issue of Genron, the theme of which is “Escape from Postwar Japanese Art.” While thinking through the contents of the issue I had the full cooperation of art critic Yohei Kurose, a friend and regular contributor to the magazine. The title of the issue suggests, first of all, the desire to both dismantle and update the theoretical framework of postwar Japan that describes it as a bad place [warui basho], setting limitations on the postwar art— no, the contemporary culture as a whole— of Japan. Since the theory’s introduction nearly twenty years ago by Noi Sawaragi in his Japan/Contemporary/Art (Nippon/gendai/bijutsu, 1998), this framework has, like a curse, continued to haunt the critical landscape of Japan. In reality, though, was Japan’s so-called postwar really all that peculiar? Even if it we concede that it was somehow unique, I suspect there would not be a universal framework by which we might relativize that uniqueness. This issue was in Kurose’s mind while paying the utmost respect to Sawaragi’s work. For potential answers to Kurose’s question we have assembled a round-table discussion between Sawaragi, Makoto Aida, and Reiji Ando, a translation of works by Hans Belting and others, as well as essays by Atsushi Shinfuji, Shigemi Inaga, and Seiichi Tsuchiya. Additionally, I thought it might be possible to sneak in a different perspective to the same question from a place beyond the world of art criticism. For that reason I have included a brief introduction to the Korean exhibition known as the REAL DMZ PROJECT, an interview with the curator of said project Sunjung Kim, and an essay by media artist and critic Park Chan-kyong. What we find being discussed in these works is the story of contemporary Korea. As such, at first glance they might seem to be of no relation to the theme of this issue, namely escaping from postwar Japanese art. However, for me, it is the introduction of such a project that pushes the discussion beyond art, dismantling the debates surrounding postwar Japan in general; I thought it was one key to escaping from the gravity of postwar Japan as a bad place. The reasons for this are as follows. What does the DMZ of the title mean? I wrote that the exhibition venues are located near the border between North and South Korea. In reality, though, border in the normal, static sense of the word is an inaccurate expression because North and South Korea are technicially still in a state of war and as such do not acknowledge each other’s existence as nations; therefore, technically, a border as a national border also does not exist. Instead, what lies between the two countries is a military demarcation line drawn up with the 1953 cease-fire agreement of the Korean War. As part of the same agreement, and in addition to the military demarcation line, there was a demilitarized zone establshed. This demilitarized zone is often abbreviated as DMZ. The DMZ was intended to be four kilometers wide running north-south but in the course of the past 60 years North Korea and South Korea have continued to sporadically encroach each other’s so-called “border”; as a result, at certain spots this “border” has shrunk to a mere 700 meters. Even still, it extends 250 kilometers moving east to west, and this vast land covering a total area of 570 square kilometers has transformed into a no-man’s land where humans may not enter. Though slightly different from Sawaragi’s usage, we might say that the postwar condition gave birth to the DMZ, yet another bad place. The REAL DMZ PROJECT was designed to show that reality (the realness) of the demilitarized zone. The military demarcation line of the Korean peninsula is known the world over as the site of one of the most tense national borders. In the fall of 2010, a serious conflict erupted at the border above the Yellow Sea that appeared to signal the onset of war; more recently, in the summer of 2015, landmines buried in the demilitarized zone by North Korea exploded, causing two South Korean soldiers to suffer serious injuries. Interestingly enough, however, the South Korean government is enthusiastic about turning the DMZ and its surrounding areas into a tourist attraction. If you have visited Seoul before you are probably already familiar with trips to the DMZ, which are referred to as security tourism (anbo gwangwang) in Korean while tours geared towards foreigners are simply called DMZ tours. Both are heavily advertised, with brochures on display at any mid-level hotel and above. Though billed as a tour of the DMZ, in reality you cannot actually enter the demilitarized zone. Just beyond the DMZ, however, is the Civilian Control Zone (CCZ), a space where entry by the general public is limited. Contained within the CCZ are numerous historical sites: remains from the Korean War, vestiges from North Korea’s attempt to invade South Korea, and leftover railroad tracks split in two at the border. These are all stops on government sanctioned tours; you can also climb an observation deck overlooking the DMZ and peer into a North Korean town just over the border. When relations between the two countries are stable, visitors are also able to enter into the Joint Security Area (JSA) of the DMZ, or Panmunjeom, and take commemorative photos with North Korean soldiers standing just over the border. (Needless to say the North Korean soldiers never crack a smile.) Such DMZ tours were at one time open only to foreign tourists. From the mid-1990s, however, Korean nationals were permitted to participate in the tours, which has since grown into a large tourist industry. Nearly everyday there are tour buses departing from hotels in Seoul, and a daily DMZ Train is operated by Korail (Korea Railroad Corporation). About 40 kilometers north of Seoul is Imjingak, a park known as the gateway to the DMZ Tour and home of the Bridge of Freedom. According to an official brochure, Imjingak attracts more than 5,000,000 visitors annualy. Within the park is the entrance to the Civilian Control Zone, but because the facility itself is free of charge it is difficult to determine exact attendance numbers. An annual count of 5,000,000 visitors places the DMZ Tour within the top twenty amusement parks in the world and makes it the third highest park in Korea after Lotte World (7,600,000 visitors) and Everland (7,380,000).2 Today the DMZ Tour is clearly a pillar of Korea’s tourism industry. This sort of touristization is, of course, deeply intertwined with South Korean policy and ideology. Plans for the DMZ Tour were promoted by the so-called Sunshine Policy implemented from the late 1990s until the end of 2000s, a policy that aimed at easing tensions with the North. Therefore, publicly at least, the DMZ Tour must always present itself as hopeful for unification and seeking reconciliation with the North. And yet, the reality is much more complex. In fact, here and there on the tour participants are faced with exhibitions and videos that stress the threat of North Korea. For example, at the so-called Third Tunnel in Paju, visitors are guided by a seven-minute video. The tunnel itself was discovered in 1978 and is thought to have been constructed by North Korea in an attempt to invade the South. With a flashy soundtrack playing in the background, the high-tempo and well-edited video documents skirmishes with the North over the past half-century in a style reminiscent of a trailer for a big-budget war film. Watching the film, one loses sight of whether the Korean government is seeking peaceful reconciliation with the North or a final resolution vis-a-vis war. In any case, the screening room is equipped with headphones offering translations into Japanese and many other languages, and its purpose as propaganda especially designed for foreign tourists is obvious. The target of the propaganda is not only foreigners. At the Cheorwon Peace Observatory our team passed what seemed to be a group of high school boys being led around by their teacher. The boys, clearly from the countryside, laughed innocently and gave the peace sign when our editor turned her camera on them. In a few years they, too, will be called upon to serve two years of compulsory military service. A few of them might actually confront the “enemy” while stationed at the border. In this way, security tourism also functions as an educational tool for a younger generation of South Koreans. Heidegger’s claim (called existentialism) resonated with the political crises that began with the Second World War and continued throughout the Cold War; it was extremely influential during the middle of the twentieth century. Thus, in a sense, the twenty-first century disposition to only pursue security is equivalent to nothing other than to what was called falling (Verfallen) within the twentieth-century philosophical paradigm. Our contemporaries are constantly seeking security, namely a state in which concern for the world is not necessary. This is especially true for tourists. Tourists go to safe places where they can walk around a town freely, eat meals, buy souvenirs, and then head back home. They are able to do this because no one expects them to show any concern for the world, namely the politically and socially complicated reality around them. In Heidegger’s words, however, this is nothing more than a fall into becoming the the “they.” In fact, it is precisely so that we might become the “they”, become surrounded by idle talk, and eventually experience the fall that we head to tourist destinations. Thus, we can say that dark tourism— the act of intentionally travelling to places that have at one time had their safety threatened by means of war, disaster, or genocide—is a self-contradiction, a paradox of tourism. You might even call it the deconstruction of tourism. We flock to the sites of tragedy as tourists. We go because we are tourists. That is dark tourism. At such occasions the lands of tragedy demand concern. They call out for us to move beyond the fall. But as long as we are tourists we cannot answer their demand. It is there that we come to know the limits of tourism. Yet, and significantly, the reason we were able to know that limit is because at one time we became tourists; that is, because we were surrounded by idle talk and experienced the fall. My interest in the DMZ Tour stems from the points outlined above. The DMZ Tour is a typical example of dark tourism. John Lennon and Malcolm Foley, scholars of tourism, offers three characteristics of dark tourism: “first, that global communication technologies play a major part in creating the initial interest […]; second, that the objects of dark tourism themselves appear to introduce anxiety and doubt about the project of modernity […]; third, the educative elements of sites are accompanied by elements of commodification and a commercial ethic which […] accepts that visitation as an opportunity to develop a tourism product.” 4 The DMZ Tour perfectly satisfies all three of these conditions. The tour is widely advertised online, and tourists from all over the world gather there. The propaganda presented on the DMZ Tour is flashy video easily mistaken for a Hollywood film; at souvenir shops textbooks are lined up next to badges and t-shirts. And, above all else, the destination of the DMZ Tour is that grand failure of the project of modernity (i.e. communism): it is the very negative legacy left behind by the Cold War. The Korean peninsula’s demilitarized zone is perhaps the world’s most successful destination for dark tourism. It is there that politics and entertainment, seriousness and unseriousness, and existence and fall are most tightly drawn together. I have argued in recent texts such as Chernobyl Dark Tourism Guide (Cherunobuiri daku tsurizumu gaido, 2013), Fukuichi Kanko Project (Fukushima daiichi genpatsu kankochika keikaku, 2013), and Weak Connections (Yowai tsunagari, 2014) that it is within this sort of self-contradiction or self-deconstruction that the buds of an ethics exists for living in a modern world subsumed by capitalism. And this is not all: the reason I am writing about the DMZ Tour is not simply because it is a successful example of dark tourism; rather, it is also because the REAL DMZ PROJECT was always there as a critical response. Because I am not an art critic it is not possible for me to decide whether or not the REAL DMZ PROJECT is productive as an art project. However, just by reading the interview with Sunjung Kim included in this issue you can see that her strategy is a clever one; it is crafty (kokatsu) in the most positive sense of the term. She is, of course, critical of the current state of tour. She does not, however, criticize the act of touristization. Rather, after having accepted the ambitions of local governments, military violence, and the pleasure of commerce, Kim is thinking about how to quietly inject completely different ideas into the minds of visitors. This is why her 2012 exhibit was incorporated into the standard visitor’s route of the Cheorwon DMZ Tour and why the 2015 exhibit was held in the downtown area of a major tourist destination. The REAL DMZ PROJECT is not a negation of DMZ dark tourism. Quite the contrary: it is the expansion of dark tourism; it is an attempt to deliver deeper and further the range of the paradox I call the deconstruction of tourism. The REAL DMZ PROJECT belongs to the world after dark tourism. I realized that if Genron were to do a special issue on art it would be essential to have our Japanese readership come to know the existence of this world. Five years after the Great East Japan Earthquake, many of the remains from the disaster have been removed because they evoke painful memories for the victims. The establishment of disaster-prevention parks and museums is progressing extremaly slowly. China, however, immediately preserved the town that was reduced to ruins as a result of the 2008 Sichuan Earthquake, designating it a memorial park (Beichuan Earthquake Museum). When I visited in 2011 to gather information it was already attracting large numbers of tourists.5 In 2013 I also visited Chernobyl. For a long time, Ukraine prohibited visitors from entering the vast land surrounding the accident site. From 2011, however, they began accepting tourists. Visitors are lent a dosimeter, which is intended to teach them about the harmful effects of radioactivity. Based on my experiences in Sichuan and Chernobyl I proposed that we should turn the site of the 2011 nuclear accident into a site for tourists. My proposal was laughed off in Japan because people thought tourists would not dare to come before decommissioning had not yet commenced and the danger of radioactivity was still present in the land. However, as have I shown, the reality is that in Korea a conflict zone still under military tension attracts millions of tourists annually by commodifying that very tension. In a manner of speaking, the DMZ is far more dangerous than both Chernobyl and Fukushima; even still, tourism has been firmly established there. It is not an easy task classifying human behavior, whether it be politics or entertainment, seriousness or unseriousness, or existence or the fall. Human beings are full of contradictions: they can be serious and, at the same time, unserious; the relationship between art and society must be discussed with such a premise in mind. However, somewhere along the way the Japanese people lost the will or power required to confront these contradictions head-on. The mentality currently dominating in Japan is neither serious (majime) nor unserious (fumajime); rather, it is perhaps best described as sober (kimajime). A sober approach despises more than anything the mixing of the serious and unserious. The line of demarcation it draws between politics and entertainment is clear. Moreover, it tries to distinguish between serious art and unserious art. Thus, the arts and politics of Japan—whether in Okinawa, Fukushima, or any region confronted with political struggles—are only capable of being connected with each other when sober and hollow slogans are employed: one often hears of a “community-driven” “town revitalization project” “making the local healthy again”. Such discourses of social gentrification are given far greater priority than that of dark tourism. I feel here in Japan it would even be difficult to ever propose something analogous to the REAL DMZ PROJECT. During the round-table discussion in Genron 2 I touched upon Norihiro Kato’s 1997 After Defeat (Haisengo-ron, 1997). After Defeat is a work nearly contemporaneous with Sawaragi’s Japan/Contemporary/Art, and their concerns resonate with each other. What Kato questioned in that text was how Japanese discourse can break free from the gravity of the distortions or fissures—what Sawaragi called the bad place—of postwar Japan. Kato’s questioning drew a heated response; because it also involved a historical evaluation of the Second World War it was met with great criticism. The most famous among his critics was the philosopher Tetsuya Takahashi. Kato responded to Takahashi’s academically refined yet somewhat dogmatic and argumentative criticism by objecting that, in fact, the problem lay in writing itself, namely his tone. Kato then goes on to quote Hannah Arendt, stating that to resolve the postwar distortions a flippant—that is, a loose, perhaps even impolite—style is important.6 This response by Kato was received as a mere defensiveness and was not well-received. During the following decade it was not Kato but Takahashi who would steer the critical discourses about issues concerning the Yasukuni Shrine or the ethical evaluation of prewar Japan’s history. Nevertheless, Kato highlighted something significant here: war and genocide leave scars on the heart of a nation. Such wounds inevitably distort the field of discourse itself. This distortion destroys the trust between speakers and listeners in which one assumes that speaking the truth directly and correctly ensures the correct results will be realized. Kato believes that postwar Japan is in precisely such a distorted and twisted situation. From Kato’s perspective, then, we can imagine that Takahashi’s criticism, advocating a justice based on the faith that others will say the correct things in a correct manner (“we should indefinitely feel shame [for what we did] and not forget [our] responsibility”) , is non-response that suggests a fundamental misunderstanding of the nature of the condition of discourses in postwar Japan. Kato was, in other words, arguing that one can never escape from a bad place by simply being serious and responsible. Japan has now become a harmless, tedious, and serious nation where nobody gets hurt, only accepting sober discourses. The existence of the REAL DMZ PROJECT compels us to reflect deeply on the meaning of such sobriety. Let me introduce another issue here at the end. Kato states in After Defeat that “the essence of the postwar era lies in the fact that the society known as Japan is, in a manner of speaking, split into two personalities.”7 The wounds of defeat divide Japan’s national identity and, as a result, its field of discourses, too, is divided. Generally speaking, this division is regarded as stemming from various conflicts of ideologies: conservative or progressive; right wing or left wing; constitutional reform (kaiken) or constitutional preservation (goken). For Kato, however, this should be understood as a split personality: what does it mean to be Japanese? Who are the Japanese? —The answers to these questions differ among people of the same nation. Their different answers reveal the fragmented personalities among that nation. This is an incisive point by Kato. Twenty years since the publication of After Defeat we can see how his point is all the more valid when looking at the almost daily futile arguements between the neto-uyo8 (short for netto uyoku, or “internet right-wingers”) and the payoku9 (a portmanteaus of payopayochin and sayoku) on internet-based forums that never seem to lead anywhere. The neto-uyo and the payoku do not debate policy or ideology as such: Do we change the constitution or do we protect it? Do we criticize China and Korea or do we embrace them? Which stance of the two makes for a decent Japanese citizen?—The answer to these questions offered by the neto-uyo and the payoku of course differ; as such, their identities are different, too. These differences in identity construct the division between the neto-uyo and the payoku. Kato spoke of that division in terms of the spatial metaphor of the confict between an inward-facing self (domestically oriented) and an outward-facing self (internationally oriented), the former being right-wing while the latter being the left-wing. However, it would perhaps be more accurate to understand these terms from the perspective of their historical origins because at present, nearly a quarter of a century since Japan’s defeat in the War, discourse of the neto-uyo variety is not only inwardly directed but unscrupulously disseminated abroad while the sensibility of postwar democracy is itself internalized as such by many people. Japanese citizens today have two different historical origins, two different instances of what might be called a we. On the one hand are nationalists who, locating their origins in the Meiji Restoration of 1868, sense a bond with the dead soldiers of World War II; on the other are supporters of the postwar democracy who, seeing their own origins in the 1945 secession of war, experience the pain of World War II almost as if prewar Japan had been something like a foreign nation. For the former, the present Japanese constitution was clearly forced upon us after the war by the occupying U.S. forces; for the latter, the constitution itself that serves as the point of departure for our freedom. The latter believe all prewar follies to be nothing more than crimes committed by military hawks before the creation of a peaceful we; for the former, such a disconnect with prewar history itself is an astonishing form of amnesia that lacks reverence and awe for our ancestors. The Japanese people reject their past on the one hand while proudly embracing their traditions on the other hand—and these two states can co-exist without contradiction. In other words, the Japanese of the postwar era suffer from split personalities. However, this sort of bad place is not unique to Japan. We must think about not a bad place but bad places. On my most recent trip to Seoul I visited three museums of history: the Seodaemun Prison History Hall, the War Memorial of Korea, and the National Museum of Korean Contemporary History. The Seodaemun Prison History Museum is built on the site of a prison from the era of Japanese occupation, and the prison has been reconstructed as an exhibit. In it are wax figures recreating Korean prisoners experiencing torture at the hands of Japanese rulers. The War Memorial of Korea is, as its name suggests, a museum focusing on war; the majority of its exhibits, however, are devoted to the Korean War. In front of the War Memorial are, lined in a row, the flags of countries that assisted South Korea during the Korean War, as are memorials engraved with the names of those who died in the war. Despite being a highly political facility with military tanks and fighters on display, the memorial is popular with tourists. The National Museum of Korean Contemporary History opened its doors in 2012 near Gwanghwamun, focusing primarily on the modern and contemporary history of South Korea. Although the museum does touch upon the colonial period and the Korean War, its strength lies in its focus on the way in which contemporary Korea has became a democratic and prosperous nation. It is less political than one might expect given its name. All three of these museums are indispensable for understanding the national identity of Korea, and I imagined they would be helpful when writing about the reception of the DMZ Tour. It was with this in mind that I chose my destinations. After visiting, however, I experienced a kind of dizziness. It suddenly occurred to me that each of those museums discuss the origin of a community collectively referred to as (South) Korea; each one, however, presented a different narrative that locating origin in a different time and place. The Seodaemun Prison History Museum has the goal of spreading anti-Japanese education. Inevitably the history of this we extends to the 1919 establishment of the Provisional Government of the Republic of Korea. This is because the violence by the Japanese Empire directed at the militants of the independence movement can be spoken of in terms of a drama that directly connects to contemporary Korean society. As I mentioned earlier, the main focus of the War Memorial of Korea is the Korean War. Therefore, the decisive day here is the 1948 establishment of the Korean state, between the museum depicting the war between fellow countrymen as if it were a war of freedom from the fatherland. (Indeed, the war is referred to as the Fatherland Liberation War in North Korea.) Upon exiting the long war exhibition, visitors are led to a circular space. The words peace and freedom are written in various languages on the wall, and on a multi-monitor installation reminiscent of the work of Nam June Paik flow videos of crowds laughing and ships blasting celebratory signal guns. What is being shown is that the birth of a true we stems from the defeat of North Korea, our evil alter ego. This is a narrative of the founding of a nation completely different from the one rooted in the defeat of Japan. Finally, at the National Museum of Korean Contemporary History, we can see a third line of demarcation. That is, the 1987 birth of the Sixth Republic, namely the democratization of the nation. Written on a panel in an exhibition room focusing on the 1980s was the following (an official Japanese translation was provided): “a battle was waged over democratization stained with the blood of opposition politicians, students, intellectuals, and laborers, “and”democracy finally won in the second half of the 1980s.” The we living in contemporary Korea is, here, redefined as those who were victorious against the pre-Fifth Republic military government; it was this new we that struck them down. When I noticed this final dividing line I felt as if I were finally able to understand why a certain segment of the Korean population does not recognize the 1965 Treaty on Basic Relations between Japan and the Republic of Korea. For them, perhaps, the decisions by the Korean government under the rule of dictatorship in the 1960s were not choises of the contemporary we but, rather, something forced upon us by them, an oppressor; therefore, we should reflect on, and amend, the treaty. This suggests that Korean identity is constructed from a superimposition of at least three different notions of a we: (i) a unified Korean idenity rooted in the struggle against the Japanese empire, (ii) a South Korean identity rooted in opposition to the North, and (iii) a democratic South Korean idenity rooted in opposition to the military government. South Korea is a nation that was at one time liberated from Japanese rule in 1945 and liberated from a North Korean invasion in 1953; liberated from the tyranny of military rulers in 1987. Each we has a different image of the self and a different image of the enemy. So the question of a bad place is not limited to Japan alone. The question of a split personality, too, is not only Japan’s problem. If Japan suffers from a double personality, then South Korea suffers from a triple personality. This probably corresponds with the fact that, for modern Japan, there was only one instance of physical trauma (defeat) while for modern Korea there were two (colonization and the Korean War). This being the case, it may very well be possible to observe such divisions in other countries, too. When conceiving of international relations, Kant once observed that it is favorable to regard a nation state with various ethnic groups as a single person.11 However, such an assumption might only have currency in Europe. The world is only comprised of countries that have experienced trauma; in actuality, Japan’s neighboring countries all have multiple personalities (that is, they are multi-personality nations, which should not be confused with multi-ethnic nations). This may be the reason diplomacy based on the premise of the nation as an individual has not been very successful with nations comprised of multiple personalities. In a sense, then, Asia in its entirety might be a bad place. Moving forward we should think again about Kato’s question in After Defeat: how might we go about recovering a single, unified personality without confining it within the boundaries of Japanese discourse? His claim that it is essential to mourn the dead for the sake of a unified subject should also be considered from another perspective. The dead sleep in the crevices of personalities. A failure to mourn ruptures a nation’s personality. In the DMZ, a space neither North Koreans nor South Koreans can even step foot into, still sleeping are a vast number of actual victims of the Korean War. The REAL DMZ PROJECT is an extended program of mourning in which one confronts the failure of mourning. If we are to revive these various unified personalities, then we may need more and more instances of mourning—or a deconstruction of mourning—here in this place called Asia a geopolitical sphere full of trauma and crowded with countries with multiple personalities. This topic, however, will have to be taken up in a later issue of Genron. 1 The organizers of the REAL DMZ PROJECT informed us that the project has almost never been referenced by the Japanese media and that Genron would be the first publication in Japan they have cooperated with. 4 John Lennon and Malcom Foley, Dark Tourism, Hampshire: Cengage Leaning EMEA, 2001, p.3. 6 Norihiro Kato, Haisengo-ron, Kodansha, 1997, p.250. 11 See Immanuel Kantís Perpetual Peace: A Philosophical Sketch. Second Section, Second Definitive Article. Even now, 66 years after the outbreak of the Korean War in 1950, South Korea and North Korea are still legally at war with each other. This has not developed into a full-fledged war, but cold-war politics have profoundly influenced South Korean society as a whole. To discuss the changes that the division of the two countries has caused in South Korean media, it is necessary to examine how South Korean artists are utilizing art, including film. Che Onejoon’s Mansudae Masterclass presented an archive of North Korean cultural diplomacy and offered a fresh point of view subverting the image of North Korea as an isolated nation. The REAL DMZ PROJECT exhibition, a contemporary art project, initiated a discussion regarding the paradox of military power buildup in the demilitarized zone of the peninsula, thus questioning the meaning of true demilitarization. South Korean cinema made great strides in the 1990s and has come to take belief and doubt as its central themes. The collectively held doubt of the characters in film reflects the core mechanisms of the South–North division. Park explains the relations between these countries, which depend on each other　for identity formation, using the metaphor of a “mirror.” Both countries continue to select opposing ideologies and systems and the ceasefire line is also a “swamp,” which drags them into endless competition. Park emphasizes that a new culture and art that resists division must go beyond these paradigms to establish a solid ground. Sunjung Kim is a leading independent curator in the South Korean contemporary art world. She has been deeply involved in the internationalization of South Korean art, successfully curating numerous art festivals and organizing contemporary art exhibitions in and outside her country. In the REAL DMZ PROJECT, exhibited in Cheorwon since 2012, she has developed a unique approach to the demilitarized zone that lies between South and North Korea. In this interview, Kim responds to questions about the project, and the relationship of art to memory and politics. Kim notes that she began the project to produce an opportunity for people to visit the location in person and think about the DMZ. She explains that it is important to remember the reality of division when one imagines the conditions that will follow the reunification of North and South Korea. Thus far the project has been run as an annual art exhibit open for a fixed period. Kim says that she now has plans to build a permanent collection of works in Cheorwon that would be open to the public at all times. Festivals like biennales effectively show many works produced in a short period of time. She says that this is precisely why she wants to take the time to carefully produce and exhibit works in this project. There are currently plans to build a theme park-like tourist venue in Cheorwon. In response, Kim has proposed the idea of a new “garden” that will preserve the traces and memories of individuals related to the DMZ. A “museum” simply offers a space to arrange collected objects. In contrast, Kim notes that she would like to create a “garden” to nurture traces and memories. According to Kim, division is not unique to South Korea. There are divisions of varying kinds between South Korea and its neighboring countries; furthermore, there are countries in situations similar to that of South Korea. Kim states that she would like to make this project an international endeavor and thus share experiences with artists having similar concerns from around the world. This discussion, as proposed by art critic Yohei Kurose, reexamines the framework of postwar Japanese art history. Kurose casts doubt on the interpretation of postwar Japanese art history as being defined by the problems of postwar Japanese society, such as “defeat,” and “America.” He further argues that the shift in social consciousness following the March 11, 2011 earthquake, tsunami, and nuclear disaster calls for a new framework for interpreting art history. Agreeing with Kurose, art critic Noi Sawaragi suggests that Japanese people ought to abolish their long-held dialectic view of history. Instead, he argues for a conception of history unfolding in a non-dialectic manner. In Sawaragi’s view, this non-dialectic history fits better with the Japanese archipelago, often beset by earthquakes, typhoons and other natural disasters. On the contrary, literary critic Reiji Ando points out that modern Japanese art is closely tied to contemporary movements in global thought. According to Ando, this is most clearly embodied in the life of the Meiji period art critic Tenshin Okakura, better known in the West as Kakuzo Okakura. In the 1950s, the age of the postwar avant-garde, authors with memories of the Japanese colonies, such as Kobo Abe in Manchuria or Yutaka Haniya in Taiwan, carried this global mindset into the field of literature. while Japanese artists adopted technology from the West, they did not absorb the ideology that usually accompanies it. Sawaragi points out that Japanese art museums don’t have the level of technology required for such a disaster-prone country, emphasizing that museums should aim for a way of preserving art such that, if given the proper maintenance, would survive even being left out in the wild and exposed to the elements. Artist Makoto Aida offered his cardboard sculpture series “Monument for Nothing II” as art exemplifying the attempt of creating something temporally bound. With this series of objects, which at first glance appear ironic, he experiments with the tension between the eternal and temporary by intentionally creating a “monument” out of easily degradable material. Finally, the members discuss artists they consider to be exceptional in the postwar Japanese art world. Kurose presents the outdoor sculpture movement as an example of the possibility of an avant-garde outside the metropolis. Sawaragi refers to Isamu Noguchi, who developed an independent style out of his double association with both Japanese and American cultures. Ando cites Anti-art and Mono-ha (School of Things) as examples of movements that carry on both the positivity seen in Japanese Buddhism, and the worldview centered on “things.” Aida argues that 1980s “Heta-uma” (unskillful but skillful) illustration is in fact a Japanese form of Neo-Expressionism. In his 1998 work, Japan/Contemporary/Art (Nippon, gendai, bijutsu), Noi Sawaragi wrote that postwar Japan is a “bad place,” one that is unable to construct a systematic “art history” like that originating in Western European modernity. Instead, Japan repeats a process of forgetting and self-destruction. Following the 2011 Tohoku Earthquake, Sawaragi stated that this notion of a “bad place” must be considered not as a mere metaphor but as a geological condition of the Japanese archipelago that cannot be rewritten. On the contrary, Sawaragi has himself continuously praised the acts of postwar art that emerged from the ruins of defeat, never dismissing them as impoverished. Was this not a display of his will to recreate or change something in the midst of the ruins of this “bad place”? Tenshin Okakura published Ideals of the East (John Murray Publishers, 1903) in the early twentieth century, in which he likened Japan to a beach where abstract ideas and thoughts arrive from the west like waves—a museum that archives these thoughts. Masao Maruyama argued that Japan is a place where various forms of foreign-born thoughts coexist in harmony, with Shinto serving as an archetype. These discourses are all limited by their view of Japan’s uniqueness as being unchangeable. The age of global art welcomes a decentralized, pluralistic worldview rather than a singular Western-Eurocentric worldview. Taro Okamoto published Our Global Art History (Waga sekai bijutsu-shi, 1999) as a proposal for rereading Hegelian history far before historians began articulating an art history that could cast off its Eurocentrism. Okamoto traced the memory of images to ancient times and envisioned human creativity as something that transcends space and time. Art in the twentieth century can only be understood in the context of exiles from natural disasters and political oppression. Today, in the twenty-first century, migrants, not exiles, emerge as a new focus of the contemporary art world. Shinfuji argues that migration should be inextricable from the impulse to seek a different world, a different place. What is sought in the avant-garde today is the imagination to renew the world through conceiving of a different place, even while residing in a “bad place” cursed with its seeming impossibility for change. The “global” market and its discourse on art continue to base their selection of works solely on the trends of Western European art history. For example, it is notable that in the extremely local case of “Postwar Japanese Art History,” only the Gutai group and the Mono-ha artists have been noticed by the global market and referenced in criticism and research; this is only because these artists visually imitate Western European modernist art. Is it possible to speak of an “art history” that escapes this type of global cultural imperialism while remaining liberated from specific local discourses? This essay presents the concept of an “art history of transposition,” which is a methodology that calls attention to cases where art is born out of mutual similarities, a shared topos, and shared political situations, regardless of country and era. For example, when Taro Okamoto visited South Korea for the first time in 1964, he superimposed the form of South Korean culture—created by the harsh political situation arising from the division of the Korean peninsula —onto the culture of Okinawa under American military occupation. In contemporary South Korea, the REAL DMZ PROJECT is an art project being carried out in proximity to the demilitarized zone. This is uncannily similar to the “Don’t Follow the Wind” exhibition that was held in the exclusion zone in Fukushima following the disaster. An “art history of transposition 2011” is a genealogy of art that can be found across the specifics of time, countries, and cultures. What is “Okinawan Art”? Yoshitaro Kamakura, who later gained renown as a stencil print artist, first recognized the value of the arts and crafts of the Ryukyu Kingdom period and inaugurated their research. Kamakura visited Okinawa in 1921, immediately following his graduation from the Tokyo School of Fine Arts (present-day Tokyo University of the Arts). He studied the arts of the Ryukyu Kingdom period and introduced them to mainland Japan. At the same time, he personally photographed the cultural heritage of Okinawa, documenting an image of the Ryukyu Kingdom prior to the Battle of Okinawa. He also took part in the preservation movement for Shuri Castle and reappraised the Bingata dyeing method of the Ryukyu Kingdom period. In 1921, the year that Kamakura set foot on Okinawa, the important Japanese folklorists Kunio Yanagita and Shinobu Orikuchi first visited the islands. It is also around this time that native Okinawans such as Fuyu Iha attempted to promote “Okinawan Studies,” in part inspired by these visits. Okinawa as a cultural field was being discovered at this time. We have another case of Okinawan Studies. Yashu Nakamatsu studied Okinawa from a geological perspective, focusing on relationships between villages—prior to the birth of political hierarchy within the community—and the Gods that protected the people. Nakamatsu’s view of Okinawan society, which rejects not only modernity but also historical Ryukyu / Okinawan royal authority, can be read as an expression of anarchism. Nakamatsu’s ideas can be understood as a new foundation for dismantling the kingdom-centric historical view of Okinawa and forging a new beginning for art in Okinawa. Could we not say that it is precisely from this kind of anarchism that Okinawan Art emerges? A number of issues remain in reconstructing World Art History (WAH), which was hotly debated in the West at the beginning of this century. The basic problem of WAH is its reliance on a Western-centric framework that excludes other regions. In France, artworks that resemble the Western avant-garde are dismissed as mere imitations, whilst innovative ones made in Japan are not seen as avant-garde because there is nothing resembling them in the Western framework. Jean-Hubert Martin curated Magiciens de la Terre (1989) to force Tibetan lamas and Ghanaian artisans into the framework of Western art but was criticized for that very reason. The unique characteristics of cultural spheres become apparent in their expressions of space and time. Arata Isozaki held an exhibition in Paris that expressed Japanese space as defined by the concept of spaces in between, or ma. Augustin Berque noted that value in Japanese architecture resides not in the individual but in the “spaces between”—or aida, another reading of the kanji character ma—that serve as their medium. Attention is drawn to the eaves and fusuma sliding panels of Japanese homes, which were interpreted as inventions of an age prior to the strict delineation of space and time. The problems associated with WAH has the potential to liberate thought from the Western framework of space and time. It was in the “cracks” in the turtle shells of ancient Chinese oracles that Hubert Damisch found hope for an art history decisively different from received notions of art history. Inaga neither blindly follows nor dismisses the proposals of WAH; instead he attempts to identify in their fluctuations dissonances between the East and West. This article examines the continuity and connections between post-World War II modern history and the November 2015 coordinated terrorist attacks in Paris from the perspective of the author’s trip starting in the northwest of France and ending in Paris. Using the experiences of the author’s first visit to Le Havre in the northwest of France the reconstruction of the city after World War II and its registration as a World Heritage Site are analyzed, followed by a contrast with the Great East Japan Earthquake. The author’s second visit is to the city of Caen, well-known for its role in the Normandy invasion on D-day. The author reconsiders how European society has digested the memory of World War II, drawing on information about the Japanese army displayed in Caen’s Peace Memorial Museum. During a trip to Paris, the author considers the cultural context of “mourning” discussed in Genron 2 and the transmission of memories of grief in France. The author also visits several terrorist attack sites and describes the states of grief at these locations where large numbers of people continue to pray for the dead. During his final stop in France to the immigrant neighborhoods of northern Paris, the author examines the conditions leading to terrorism and the mechanisms resulting in the birth of terrorists. Results suggest that conditions of present-day terrorism originate due to contradictions caused by advanced countries utilizing the resources of developing countries to their own advantages. In the post-earthquake Japan of 2029, a mysterious quantum computer enables people to predict everything in the future in their phantasmal society that is created by augmented reality. In the city of Tokimeguri, a special reconstruction zone in the Tohoku area, strange deals as well as a fight to the death takes place between three groups: the mysterious and wealthy Tokihori family, who show an unusually strong interest in time; the police; and an artificial intelligence that moves in the shadows. Each acts for their own reasons. On the night of the summer festival, our protagonist, Torihiko Shiratori, meets Yuyuka, the daughter of the Tokihori family. He finds himself slowly becoming embroiled in the conflict. Here begins the Afternoon section of the story, which began in Genron 1. It will finally reveal the mystery behind time, as well as the truth behind everyone’s actions. During his month of confinement in the Tokihori family estate, Torihiko finishes making the kakuriyo augmented reality device used during the Tokimeguri-sai. The kakuriyo is vital in his “Uchronia Plan” to slaughter Yuyuka. After its completion, Torihiko loses consciousness while speaking to the matriarch of the Tokihori family, Miyu, in the family dining hall. When he awakens, he finds himself inside the same limousine in which he was kidnapped and taken to the Tokihori estate. Did his month in the estate really only take place over fifteen minutes? Torihiko is shocked by this reversal of time and demands to be taken back to the estate, but Kirishima, the family maid, kicks him out of the car and leaves. To successfully murder Yuyuka, Torihiko asks detective Haori Kiryu to find the location of the Tokihori home.